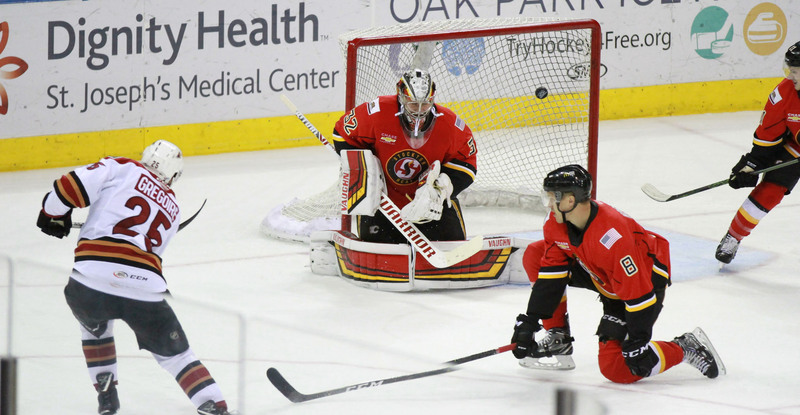 The Roadrunners’ offense broke out Saturday night at Stockton Arena as the team powered its way to a 5-2 victory over the Stockton Heat. Smooth Tucson's power play unit was, combining to score three goals on the man advantage, all of which came during 5-on-3 scenarios. Adin Hill, with goal support, is terribly difficult to beat. He stopped 23 of the 25 shots he faced to earn his 10th win of the season, turning away 48 of the combined 51 shots he faced during the weekend to backbone the team to a two-game sweep. “We need to keep playing the right way and keep doing the right things on the ice and obviously we know we can trust [Hill] back there, so if we can keep producing I’m sure we can keep winning games,” added Merkley. Despite the Roadrunners coming hot out of the gate, Stockton was first to get on the board, the Heat taking a 1-0 lead just over 10 minutes into the contest. With just over three minutes to play in the first period, Michael Chaput shoveled home a loose rebound, taking care of a deflected puck that sprang off of the post on Lane Pederson’s preceding one-time bid, tying the game 1-1. 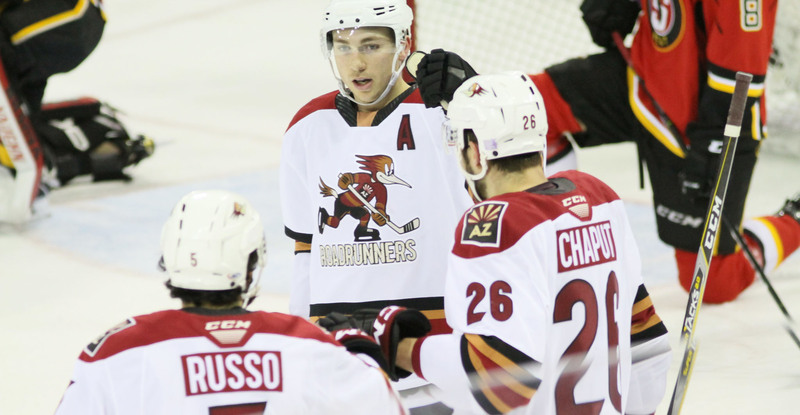 For Chaput, it was his first goal in a Roadrunners uniform and his 11th of the year overall. In the opening minutes of the second, Michael Bunting gave the Roadrunners their first lead of the game, 2-1, when he redirected a Robbie Russo shot/pass as the two eyed each other for the well-articulated sequence. Bunting’s tally extended his goal scoring streak to three games. With 11 minutes left to play in the middle frame, Pederson trailed Tyler Steenbergen as the rookie forward hunted down a loose puck deep in Stockton’s zone. Steenbergen circled and fed Pederson, who deposited from close range, upping Tucson’s lead to 3-1. Pederson’s goal was his second of the weekend and improved his team lead to a total of 16. Approaching the latter stages of the middle period, Jeremy Gregoire and Chaput entered Stockton territory on a three-on-two. After a couple of touch passes, Gregoire let loose with a wrist shot, scoring high to the glove side, improving the scoreboard to a 4-1 look for the Roadrunners. Gregoire’s goal served as his third with the Roadrunners and his sixth of the campaign. Stockton scored to cut Tucson’s lead to 4-2 with 15:55 remaining in regulation. With 9:02 remaining, Bunting netted his second of the night, springing into open ice and firing home a wrist shot to give the Roadrunners a 5-2 lead, the night’s eventual final score. Leading the team in points upon the game’s final horn was Pederson, who finished the evening with three (1G, 2A), doing so for the third time in his pro career. He registered a total of five points (2G, 3A) during the Roadrunners’ two wins. “We got the two wins here we needed so we’ve got to keep that mindset going into these home games on Tuesday and Wednesday and bring our best,” Merkley said of the team’s return home. The Roadrunners begin a six-game home stand Tuesday night when they host the Iowa Wild at Tucson Arena, where the puck is scheduled to drop just after 7:05 PM.